Case IH True-TandemTM Disk Harrows are ideal for primary tillage and seedbed preparation in both spring and fall. Our disk harrows lead the industry in ruggedness and reliability so you can manage heavy crop residue with ease and level soil for the best yield potential. 22' 2" - 46' 7"
14' 6" - 18' 6"
True-Tandem disk harrow technology combines uniformly distributed pull forces with exclusive Earth Metal blades for optimal tillage performance, even in the roughest of fields. Built on proven Agronomic Design principles, our disk harrows help you effectively manage soil and residue without compaction. Slice through tough residue, uproot root balls and level the soil to create the best possible seedbed for your crop. Improve balance and stability in the field with the True-Tandem frame design. The combination of mirror-matched gangs and a rugged, low-maintenance pull-through frame eliminate drift and accommodate higher ground speeds compared with the traditional double-offset frame. LED lights and a high-quality powder coat paint finish keep you in the field longer and your equipment looking good for years to come. Work the soil you want to work. The lineup of True-Tandem disk harrows engages soil to your intended depth without disrupting soil density below the operating depth. It’s a system that’s proven to provide more consistency, even as soil types change across the field. And thanks to an intuitive depth adjustment system, you easily can adjust depth control and leveling to meet the needs of your conditions and fields. Our industry-exclusive Earth Metal disk blades help you cover rocky terrain and uneven ground with confidence — even at high speeds. Equally tough and breakage-resistant in all directions, Earth Metal disk blades are proven stronger than ordinary carbon steel blades. Perfect for no-till and minimum-till environments, these disk blades penetrate hard, dry soils to help you break through surface compaction, effectively slicing through fall crop residue or spring weed flush. New Rollable Disk Blade offering allows customers who desire the ability to edge roll the disk blade to sharpen. Made of a high quality alloy with the toughness and durability of boron while maintaining the ability to roll the edge. Note: This offering is not Earth Metal. The True-Tandem gang assembly precisely matches front and rear gang blades for maximum productivity and a smooth seedbed, regardless of field conditions. The 18-degree gang angle paired with the concavity and crimped center of each blade gives you even cutting and mixing action. With more durability and low maintenance features, the True-Tandem disk harrow will get you in and out of the field and ready to plant. Put the finishing touches on your seedbed with the double-edge TigerPaw Crumbler rolling reel. Every bar has two edges to hit large clods twice and tuck residue under the soil’s surface for improved leveling and better seed-to-soil contact. The unique design of the Crumbler ensures each bar is rifled to maintain constant down pressure, while hydraulic cylinders provide easy adjustability from the cab and settings to match any field condition. The rugged True-Tandem frame provides two height options for the hitch, depending on the tractor’s drawbar. Whether going across rugged, rolling terrains or field to field, you’ll be able to easily maneuver your equipment. Hitch vertical capacity is 1,000 lb. Reduce compaction in your fields with large, stubble-resistant tires. Providing a greater footprint, these tandem wheels work independently for a smoother ride and longer life. With the rockshaft mounted directly to the frame, the hubs and tires are more durable and tillage tool more balanced. 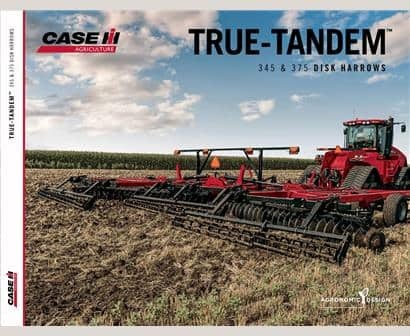 Case IH True-Tandem™ 345 disk harrows, with working widths of 22 to 47 feet, provide straight, easy pulling for primary tillage, seedbed preparation or chemical incorporation. Case IH True-Tandem™ 375 disk harrows, with working widths of 22 to 47 feet, deliver maximum pass coverage, durability and low maintenance with agronomically sound design features. Tough field conditions call for rugged, reliable tillage tools. Learn more about equipment you can depend on at the Case IH blog. ​Configure and price your new True-Tandem Disk Harrow. Customize it the way you want. ​Compare our True-Tandem Disk Harrow specs to other manufacturers' specs. Keep on top of the latest product information, farm show reports, and industry news.